Complex is SOLD OUT Except for THIS NEW Unit! Its COMPLETELY 100% Renovated! 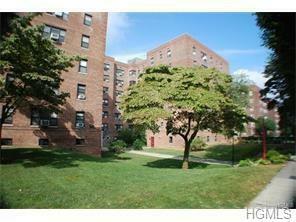 Heres your opportunity to own an Updated Large Bright/Clean 1 BR Luxury Coop w/NEW Bthrm, Kit, Beautiful Hardwood Flrs! TOTALLY AMAZING Affordability & Luxury ONLY 14 Miles from Midtown! ONLY 22 QUICK Minutes to Grand Central Station on Metro North! Huge/Bright w/ Roomy Floor Plan! P+L+U+S Star Reduction Reduces Monthly Maint' by -$170! Coop Boasts Quiet Park Setting on Dead End Loop, Beautifully kept bldg w/ manicured lawns/grounds! Westchester's LOWEST Maint w/Strongest Financials! EZ/Quick Board! *Believe it! You can REALLY Own a Luxury Coop so close to the city for Less than $900 A month (cheaper than renting a 1 BR!) after down payment (5% mort/30 years)& monthly maint' ~ Take off -$170(star)=less than $735 TO OWN a Nice Renovated 1BR Coop? REALLY? Yes Really! There's NO REASON to Rent for 50% HIGHER than OWNING a Nice Coop! So Call TODAY for a private showing & come 'buy'! WELCOME TO THE AMERICAN DREAM! Listing courtesy of Monique Johnson of Greater Metro Realty Group Llc.